1890 William Kennedy Laurie Dickson, commissioned by Thomas Alva Edison, built the first modern motion-picture camera and named it the Kinetograph. 1889 or 1890 William K.L. Dickson filmed his first experimental Kinetoscope trial film, Monkeyshines No. 1, the only surviving film from the cylinder kinetoscope, and apparently the first motion picture ever produced on photographic film in the United States. It featured the movement of laboratory assistant Sacco Albanese, filmed with a system using tiny images that rotated around the cylinder. 1891 Thomas Edison and his assistant W.K.L. Dickson also developed or invented the Kinetoscope, a single-viewer peep-show device in which film was moved past a light. It was the first recognizable motion picture machine. Allegedly, the first public demonstration of motion pictures in the US using the Kinetoscope was presented to the National Federation of Women’s Clubs. The very short film’s test footage, 3 seconds in length and titled Dickson Greeting (aka Monkeyshines 2), displayed William K. L. Dickson himself, bowing, smiling and ceremoniously taking off his hat and passing it from one hand to another. It was filmed on May 20, 1891 at Edison's laboratory of Photographic Building (West Orange, NJ). Edison filed for a patent for the Kinetoscope in 1891 that was granted in 1893. On Saturday, April 14, 1894, a refined version of Edison's Kinetoscope began commercial operation. 1892 Dickson and Edison built a vertical-feed motion picture camera in the summer of 1892. It used a film strip that was 1 1/2 inches wide. This established the basis for today's standard 35 mm commercial film gauge, occurring in 1897. The 35 mm width with 4 perforations per frame became accepted as the international standard gauge in 1909. June, 1892 The Limelight Department, one of the world's first film studios, was officially established in Melbourne, Australia. 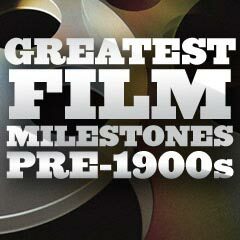 In the next nine years, it produced arguably the first feature-length film (a series of 13 films titled Soldiers of the Cross (1900) delivered as a 'multi-media' presentation of songs, slides, films and scripture) and documentary film (the Federation of Australia ceremony (January 1, 1901)) in the world. The first public performance of a motion picture show was given in Paris by French inventor Charles-Émile Reynaud at the Musee Grevin (using his modified animated device known as a praxinoscope, or Theatre Optique film system, that used perforations for the first time). The hand-operated projected show (known as Pantomimes Lumineuses) was of color animated (cartoon) images that had been hand-painted directly onto a transparent strip of film. The three films that were shown included Pauvre Pierrot (aka Poor Pete) (500 frames, 15 minutes), Un Bon Bock (aka A Good Beer) (700 frames, 15 minutes), and Le Clown et Ses Chiens (aka The Clown and His Dogs) (300 frames, 10 minutes). 1893 Edison completed construction of the world's first motion picture production studio in West Orange, New Jersey, a Kinetograph production center nicknamed the Black Maria (slang for a police van). Construction began in December 1892, and it was completed by February 1, 1893, at a cost of $637.67 - it was only a tiny wood-framed building covered in tar paper. Many major show-business performers would soon star in Edison films made at the Black Maria, including "Strong-Man" Eugene Sandlow, "High-Kicker" Ruth Dennis, and performers from the Barnum & Bailey Circus and Buffalo Bill's Wild West Show (Annie Oakley and 'Buffalo Bill' Cody). 1893 Thomas Edison displayed 'his' Kinetoscope projector at the World's Columbian Exhibition in Chicago and received patents for his movie camera, the Kinetograph, and his electrically-driven peepshow device - the Kinetoscope. On May 9, 1893, Edison also held the world's first public exhibition or demonstration of films at the Brooklyn Institute of Arts and Sciences. The 34-second film, Blacksmith Scene, was viewed on Dickson's Kinetoscope viewer, and was shot using a Kinetograph at the Black Maria. It showed three people pretending to be blacksmiths - the first instance of of actors performing a role in a film. April 14, 1894 The first Kinetoscope parlor, consisting of a row of coin-operated kinetoscopes (single-viewer, peep show device, for films produced with the Kinetograph camera) opened at 1155 Broadway (in a converted shoe store) in New York City for business on April 14, 1894 -- it was called the Holland Brothers' Kinetoscope Parlor. This marked the first commercial presentation of a motion picture, seen on a total of ten Kinetoscope machines (in two parallel rows of five). Each film cost 5 cents to view (or 50 cents for all ten reels). The mostly male audience was entertained by a single loop reel depicting clothed female dancers, sparring boxers and body builders, animal acts and everyday scenes. Soon, peep show parlors were set up in penny arcades, hotel lobbies, and phonograph parlors in major cities across the US. 1894 Edison's 1-minute Kinetoscope short comedy The Boxing Cats (1894) was possibly the first instance of filmed comedy, in its depiction of two cats (donning boxing gloves) in a small boxing ring. 1894 Kinetoscope parlors quickly opened across the country. One of the companies formed to market Edison's Kinetoscopes and the films was called the Kinetoscope Exhibition Company. It was owned by Otway Latham, Grey Latham, Samuel Tilden, and Enoch Rector. In the summer of 1894 in downtown New York City (at 83 Nassau St.), it set up a series of large-capacity Kinetoscopes (able to handle up to 150 feet of film), each one showing one, one–minute round of the six round Michael Leonard-Jack Cushing Prize Fight film (produced and filmed at Edison's Black Maria studio). Each viewing cost 10 cents, or 60 cents to see the entire fight. The popular boxing film was the first boxing film produced for commercial exhibition. 1894 Fred Ott's Sneeze (aka Edison Kinetoscopic Record of a Sneeze), was one of the first series of films made in Edison's Black Maria and noted for the first medium-closeup shot. It became the first film officially registered for copyright on January 7, 1894. 1894 The short film Dorlita in the Passion Dance (1894), shown in peep show parlors, was probably the first film ever to be banned in the U.S. (in New Jersey). 1894 A short film (about 21 seconds long) titled Carmencita (1894) was directed and produced by Edison's employee William K.L. Dickson. She was filmed March 10-16, 1894 in Edison's Black Maria studio in West Orange, NJ. Spanish dancer Carmencita was the first woman to appear in front of an Edison motion picture camera, and quite possibly the first female to appear in a US motion picture. In some cases, the projection of the scandalous film on a Kinetoscope was forbidden, because it revealed Carmencita's legs and undergarments as she twirled and danced. This was one of the earliest cases of censorship in the moving picture industry. June, 1894 Pioneering inventor Charles Francis Jenkins became the first person to project a filmed motion picture onto a screen for an audience, in Richmond, Indiana, using his own invented movie projector termed the Phantoscope. The motion picture was of a vaudeville dancer doing a butterfly dance - it was the first motion picture with color (tinted frame by frame, by hand). It was the first patented film projector. 1894-1895 The earliest hand-tinted color films ever publically-released were Annabelle Butterfly Dance (1894), Annabelle Sun Dance (1894), and Annabelle Serpentine Dance (1895) featuring the dancing of vaudeville-music hall performer Annabelle Whitford (known as Peerless Annabelle) Moore, whose routines were filmed at Edison's Manufacturing Company in New Jersey and directed by William K. Dickson. Male audiences were enthralled watching these early depictions of a clothed female dancer (sometimes color-tinted) on a Kinetoscope - an early peep-show device for projecting short films. 1894-1895 In the early 1890s, Edison and Dickson also devised an early prototypical sound-film system called the Kinetophonograph or Kinetophone - a precursor of the 1891 Kinetoscope with a cylinder-playing phonograph (and connected earphone tubes) to provide the unsynchronized sound. The projector was connected to the phonograph with a pulley system, but it didn't work very well and was difficult to synchronize. The first known (and only surviving) film with live-recorded sound and specifically made to test the Kinetophone was the 17-second The Dickson Experimental Sound Film (1894-1895). It was formally introduced in 1895, but soon proved to be unsuccessful since competitive, better synchronized devices were also beginning to appear at the time. Edison's attempt to combine the phonograph and motion pictures failed commercially. 1895 The dubious claim was made that the 17-second The Dickson Experimental Sound Film (1894-1895) was the first movie to depict homosexuality, due to the fact that two men were seen dancing together in the short clip. March 22, 1895 The first public testing and demonstration of the Lumieres' camera-projector system (the Cinematographe) was in their basement. During the private screening to a scientific conference - a trial run for their public screening later at the end of the year (see below), the Lumieres caused a sensation with their first film, Workers Leaving the Lumiere Factory (La Sortie des Ouviers de L'Usine Lumiere a Lyon), although it only consisted of an everyday outdoor image - factory workers leaving the Lumiere factory gate for home or for a lunch break. 1895 Incident at Clovelly Cottage (1895, UK) (aka Incident Outside Clovelly Cottage, Barnet), produced and shot by Birt Acres, is considered the first British film, and the first successful motion picture film made in the UK. 1895 The first historical book to be published (as a monograph with 55 pages and 54 illustrations) on the subject of film was History of the Kinetograph, Kinetoscope, and Kinetophonograph, written by Edison's pioneering motion picture assistant William Kennedy Dickson with his sister Antonia. A preview version of the book appeared the year earlier in The Century Magazine (June 1894 issue). April 21, 1895 In New York on Frankfort Street, a device called the Eidoloscope Projector (aka the Pantoptikon) was demonstrated for the NY press by Woodville Latham (who had been working with Eugene Lauste and W.K.L. Dickson). It was one of the first public exhibitions of motion pictures in the world. Latham was credited with the "Latham Loop" - a feature of movie projectors involving a loop to feed the film smoothly, and to allow for longer films. (This showing preceded the landmark exhibition of the Lumieres in Paris by about eight months. See below.) On June 1, 1895, Latham applied for a patent for his "Projecting-Kinetoscope" with the "Latham Loop." It was granted and lasted until its expiration in 1913. By 1905, virtually all movie projectors used the Latham Loop. May 20, 1895 A filmed boxing match between Australian fighter Albert Griffiths (Young Griffo) and Barnett, titled Young Griffo v. Battling Charles Barnett (filmed on the rooftop of Madison Square Garden on May 4, 1895 by Woodville Latham and his sons Otway and Grey) was the first motion picture in the world to be projected onto a screen before a paying audience, at a storefront theatre at 156 Broadway in New York City. The eight minute B&W silent film (shown on one continuous reel of film without interruption, using the "Latham Loop" to prevent tearing) premiered on May 20, 1895, more than seven months before the Lumière Brothers showed their film in Paris (see below). 1895 The Execution of Mary, Queen of Scots (1895) contained the first special effect (in-camera), reportedly, of the controversial execution (decapitation) of Mary, Queen of Scots (Robert Thomae) on the execution block, using a dummy and a trick camera shot (substitution shot or "stop trick"). It was reportedly the first shot using special effects (i.e., stop-action). In the short silent sequence, Mary knelt down, and put her head on the block as the executioner raised a large axe. When the axe was brought down, her head rolled off the chopping block to the left - where the executioner picked it up in the final frame and held it up. Sept-Oct, 1895 Charles Francis Jenkins and Thomas Armat projected Kinetoscope films at the Cotton States Exposition, Atlanta, Georgia, using their Phantascope projector instead of a Kinetoscope. Dec. 28, 1895 In France, two brothers Auguste and Louis Lumière had invented the Cinématographe which was patented in early 1895. It was a combination hand-held movie camera and projector, capable of showing an image that could be viewed by a large audience. They held their first public screening or commercial exhibition in the last few days of 1895 - often considered "the birth of film" or "the First Cinema" since the Cinematographe was the first advanced projector (not experimental) and the first to be offered for sale. They projected a motion picture onto a screen for the first time in the basement room called the Salon Indien at the Grand Café on 14 Boulevard des Capucines in Paris. It was the first commercial exhibition of a projected motion picture to a paying public in the world's first movie theatre - the Salon Indien. The 20-minute afternoon program shown to an invited paying audience of 33 people included ten short films (or "views") with twenty showings a day. The ten shorts ("sujets actuels") included the famous first comedy of a gardener with a watering hose (aka The Sprinkler Sprinkled, The Waterer Watered, or L'Arrouseur Arrose), the factory worker short (La Sortie des Ouviers de L'Usine Lumière à Lyon, or Workers Leaving the Lumiere Factory), a sequence of a horse-drawn carriage approaching toward the camera, and a scene of the feeding of a baby. The Lumieres also became known for their 50-second short Arrivee d'un train en gare a La Ciotat (1895) (Arrival of a Train at La Ciotat), which some sources reported was shocking to its first unsophisticated viewing audience. With a few exceptions, the early films were mostly documentaries (or films of every-day life) - or so-called actualités. 1896 The Kiss (1896) (aka The May Irwin Kiss) was the first film ever made of a couple kissing in cinematic history. May Irwin and John Rice re-enacted a lingering kiss for Thomas Edison's film camera in this 20-second long short, reenacted from their 1895 Broadway stage play The Widow Jones. It became the most popular film produced that year by Edison's film company (it was filmed at Edison's Black Maria studio, in West Orange, NJ), but was also notorious as the first film to be criticized as scandalous and bringing demands for censorship. 1896 The "Pathé-Frères" Company was founded in 1896 in Paris by Charles and Emile Pathè. By the next decade, it would become the largest producer of films in the world. Around 1906-7, only one-third of the films released in the US were American-made. Pathé-Frères was responsible for over one-third of the films shown on US screens. 1896 Edison's Company (because it was unable to produce a workable projector on its own) purchased an improved version of Thomas Armat's 1895 movie projection machine (the Phantascope, originally invented by Charles Francis Jenkins in 1893), and renamed it the Vitascope. It was hailed as Edison's latest invention, although he had only commercialized the Phantascope. It was the first commercially-successful celluloid motion picture projector in the US. April 23, 1896 Thomas Edison presented the first publically-projected Vitascope motion picture (with hand-tinting) in the US to a paying American audience on a screen, at Koster and Bial's Music Hall in New York City (at 34th Street and Broadway), with his latest invention - the projecting kinetoscope or Vitascope. At the time, the Vitascope was showing films in only one location, this one in NYC, but that wouldn't last for long. Customers watched the Edison Company's Vitascope project a ballet sequence in an amusement arcade during a vaudeville act. July 7, 1896 The first public film exhibition in Asia was held on July 7, 1896, at Watson's Hotel in Bombay, India. It was the advent of cinema in the continent of Asia, about six months after the Lumieres had held their first public film exhibition in Paris in late 1895 (see above). The pioneering exhibition, called "the marvel of the century, the wonder of the world," was organized by Lumieres' agent Maurice Sestier, and consisted of some of the same Lumiere shorts shown in Paris (Arrival of a Train at La Ciotat and Workers Leaving the Lumiere Factory). July 26, 1896 After showing films in a lakefront park, William "Pop" Rock and Walter Wainwright transformed a converted vacant store (at 623 Canal St.) in New Orleans, Louisiana into Vitascope Hall. It became the first "storefront theater" or building in the US dedicated exclusively to showing motion pictures, although it screened films for only two months. The theatre accommodated 400 people, and had two shows per day, with admission 10 cents. October 19, 1896 The world's first permanent movie theatre exclusively designed as a venue for showing motion pictures was the Edisonia Vitascope Theatre (aka Edisonia Hall), a 72 seat theatre which officially opened in downtown Buffalo, New York on Monday, October 19, 1896 in the Ellicott Square Building on Main Street. It was created by Buffalo-based entrepreneur Mitchell H. Mark, a supreme visionary of the future of motion picture theaters. It was likely that the opening night's showing including US premieres of the Lumiere short films, since Mark had contracted with the Lumieres (and Pathé-Frères) in France to exhibit their films in the US. 1896 Parisian French film-maker Georges Méliès first film based on a trick of substitution (one of the earliest instances of trick photography with stop-action - an early special effect) was Escamotage d'une dame au théâtre Robert Houdin (aka The Conjuring of a Woman at the House of Robert Houdin) (1896). 1896 The black and white Coronation of the Czar of Russia (1896, Fr. ), a news short created by the Lumiere Production Company, recorded the coronation of Tsar Nicholas II, which took place in 1894. It was one of the first significant news events ever recorded. 1896 The roots of horror films (and vampire films in particular) may be traced back to French film-maker Georges Méliès' two-minute short film Le Manoir du Diable (1896) (aka Manor/House of the Devil, or The Devil's Castle, or The Haunted Castle), although it was meant to be an amusing, entertaining film. 1896 French-born Alice Guy (Blaché) started in the film business as a secretary for Léon Gaumont in 1894. In 1896, she joined Gaumont in his new company founded in Paris in 1895, the Gaumont Film Company, and began making primitive sound films when she was promoted to be the head of motion picture production at the studio. She is generally acknowledged as the world's first female director in the motion picture industry (with France's Gaumont Film Company). Her first film made in April of 1896 was the one-minute long fictional film La Fée aux Choux (The Cabbage Fairy) (1896). Some historians consider it the first ever narrative fiction film. She became one of the key figures in the systematic development of the narrative film. 1897 The American Mutoscope Company (later renamed the American Mutoscope & Biograph Company and eventually called the Biograph Company), marketed their own films and their new Biograph projector, thus becoming the foremost motion picture company in the US. The American Mutoscope Company's The Haverstraw Tunnel (1897) became its most popular film - it was the first "phantom ride" film in which a camera was mounted on the front of a train, and recorded its passage into a tunnel. 1897 Early pioneering British film-maker Robert W. Paul donated some of his treasured films to the British Museum in London, England for cataloguing and preservation, although the institution didn't know what to do with them. It can be considered the world's first film archive, although a second donation did not occur and nothing came of the effort. Others have noted that the first major (and successful) film archive in the world was established at the Museum of Modern Art (MoMA, New York) in 1935 by Iris Barry and her husband, John Abbott. 1897 Georges Méliès constructed the first movie studio that used artificial illumination, a greenhouse-like structure that featured both a glazed roof and walls and a series of retractable blinds. It was an influential model on the development of future studios. May, 1897 The Corbett-Fitzsimmons Fight (1897), another filmed boxing match, reported to be 100 minutes in length (the longest film ever to be released by that date), and shown by the Veriscope Company, had its debut on May 22, 1897 at the Academy of Music in New York City. Some consider it the world's first feature film. It included all fourteen 3-minute rounds of the bout, in addition to a 5-minute introduction, and non-stop filming during the one-minute rest period between rounds. Running commentary was provided by an expert sports announcer from the side of the ring - the first of its kind. August 5, 1897 One of the earliest projects the Edison Studios created (probably in July of 1897) was the advertising film Admiral Cigarette (1897), promoting the slogan "We All Smoke." The 28 second-long silent film was the first prototype commercial for the Admiral Cigarette company. Edison's film was the first advertising film, or commercial, to be submitted for copyright. 1897 The 35 mm film gauge became widely accepted as the standard gauge for motion pictures, although American Mutoscope and other film companies continued to use other gauges. In 1909, the 35mm width with 4 perforations per frame became accepted as the international standard film gauge. 1898 The Spanish-American War drew camera operators to Cuba, but they were shut out by the US Army. Since they could not capture the battles on film, many went into studios and created them using models and painted backdrops -- the start of scale-model effects. 1898 The William Morris Agency, founded in 1898, was the oldest major talent agency ever founded. However, its first offices were in New York City, and it didn't move out to the LA/Hollywood area until around 1930. 1898 The short theatrical 'cartoon' from Vitagraph, The Humpty Dumpty Circus (1898), a lost silent film, was the first American film to use the stop-motion technique. Guinness claimed it was "the first animated film using the stop-motion technique to give the illusion of movement to inanimate objects." Reportedly, directors/filmmakers Albert E. Smith (with James Stuart Blackton) conceived the idea, borrowing one of their young daughter's circus toys and shooting the acrobats and animals in barely changed positions one frame at a time. 1898 One of the earliest known instances of parallel action without cross-cutting was in the early one-minute single-scene short, Santa Claus (1898, UK) made by British film-maker George Albert Smith. It was notable for featuring the first opening title screen with lettering, and also contained a number of visual effects (many of which were also being perfected by French filmmaker Georges Melies) -- stop-motion jump-cuts, super-imposition multiple exposures, and iris-masking of the camera lens to produce a scene-within-a-scene in a circular vignette. May, 1898 In mid-1898, Edison filed a patent-infringement suit against the American Mutoscope Company, claiming that the studio had infringed on his patent for the Kinetograph movie camera. [Edison’s competitors had developed other motion-picture devices, which became the Biograph and the Mutoscope.] After years of legal battles, in July of 1901, a U.S. Circuit Court in New York ruled that Biograph had infringed on Edison's patent claims. Biograph appealed the ruling, claiming it had a different camera design. The decision was reversed in March 1902 by a U.S. Court of Appeals. It ruled that Edison did not invent the motion-picture camera, but allowed that he had invented the sprocket system that moved perforated film through the camera. The new ruling essentially disallowed Edison from establishing a monopoly on motion picture apparatus - and ultimately on the making of films. 1898 The American Mutoscope Company (or Biograph) made history with two of its documentary films in 1898: (1) Divers at Work on the Wreck of the Maine (1898) - the first film shot in Havana, Cuba at the location of the sunken warship, and (2) W.L.K. Dickson's filming of Pope Leo XIII in Rome, M.H. Pope Leo in a Chair (1898) - Leo XIII was the first Pope captured on film. 1898 The Passion Play of Oberammergau (1898) was taglined: "EDISON's Copyrighted Production of THE PASSION PLAY All Moving Pictures. True to Life." Audiences were led to believe that this was the filmed account of the play held only once every ten years in Bavaria, Germany. However, it was only a 'recreation' made with specially-constructed sets, and produced in New York City. A lecturer provided commentary during each venue's showing. Some have dubiously claimed it was the first narrative feature film, and the first film to split the roles of director (Henry C. Vincent) and producer (Thomas A. Edison, uncredited). The total film, about 20 minutes in length, was originally made up of 23 scenes each on a separate reel. 1899 The American Mutoscope Company, founded in 1895, changed its name to the American Mutoscope and Biograph Company. 1899 Two of the earliest westerns (or cowboy-related) films were both Edison Manufacturing Company films made at Black Maria: the one-shot (less than one minute short) Thomas Edison's Cripple Creek Bar Room Scene (1899) - with the 'first' western saloon setting, and Poker at Dawson City (1899). 1899 The French magician Georges Melies became the film industry's first film-maker to use artificially-arranged scenes to construct and tell a narrative story, with his most popular and influential film to date - Cendrillon (aka Cinderella) (1899). Melies wrote, designed, directed, and acted in hundreds of his own fairy tales and science fiction films, and developed techniques such as stop-motion photography, double and multiple-exposures, time-lapse photography, "special effects" such as disappearing objects (using stop-trick or substitution photography), and dissolves/fades. 1899 The first known Shakespearean film, an adaptation of one of the Bard's plays, was the British film King John (1899, UK) (aka Beerbohm Tree, The Great English Actor), with the title character played by stage actor Sir Herbert Beerbohm Tree. Directed by William K.L. Dickson and Walter Pfeffer Dando, and composed of only four short scenes, only one survived - the last scene of the King's death. 1899 Early Jewish film pioneer Sigmund Lubin (aka Siegmund Lubszynski) constructed the first purposely-built movie theater in West Philadelphia, PA for the National Export Exposition. Lubin's Cineograph Theatre was a small, modest portable theatre built on the esplanade or midway of the fair. It was possibly the world's first structure erected expressly for the presentation of motion pictures. For ten cents, patrons could view "continuous shows" of the Spanish-American War, reproductions of boxing matches, and several of Lubin's own home-made productions. The film billed as "The Sensation of the Hour" was The Dreyfus Court Martial Scene. It was evidence of Lubin's early work as a motion picture distributor and exhibitor, to showcase his projectors, cameras, and films.